The U.S. Department of Justice asked the U.S. Census Bureau on December 12, 2017, to add a question on citizenship to the 2020 decennial Census. Since 1850, the Census Bureau has collected data on the foreign-born population. The 1950 Census was the last time the Bureau asked such a question of every respondent. However, from 1960 to 2000, citizenship was asked of Census respondents who received the so-called "long form" — about 15 percent of the nation. The long form included detailed questions about income, welfare use, and other things, including citizenship. The long form was dropped from the 2010 Census, and there are no plans to resume it. Instead, the American Community Survey (ACS), conducted every year on roughly 3.5 million households, essentially contains the long-form questions — including several dealing with immigration, such as citizenship, year of arrival, and place of birth. Other Census Bureau surveys, such as the Current Population Survey (CPS) and the Survey of Income and Program Participation (SIPP), also ask a number of immigration-related questions, including citizenship. Several stories in the media have discussed concerns that adding a citizenship question may reduce response rates to the 2020 Census. It is not clear why a single citizenship question on the 2020 Census would reduce response rates, since the Bureau has been asking more detailed immigration-related questions for many years on a number of its largest and most important surveys. For example, in addition to asking about citizenship, country of birth, and year of arrival, the CPS also asks each respondent for his or her mother's and father's birthplaces. Surveys like the CPS are the basis — and, in many cases, considered the gold-standard source — for official government estimates on everything from the nation's unemployment and poverty rates to wages and health insurance coverage. If asking about citizenship significantly reduced data quality by lowering response rates, then a good deal of information published monthly and annually by the federal government, based on these surveys, would already be compromised. Some have suggested that the election of Donald Trump may cause immigrants, particularly illegal immigrants, to skip the 2020 Census out of fear of deportation or some other reprisal. The Center for Survey Measurement (CSM), part of the Census Bureau, conducted interviews and focus groups with field representatives and respondents and reported the results in a memo published on the bureau's web site. The memo emphasizes that respondents and field personnel often brought up the concern that confidential data provided to the bureau might be shared with immigration enforcement agencies in "the current political climate", or "given how the situation is now". Another respondent did not report information on some renters out of a concern over the "Muslim ban". Overall, the memo offers evidence of a "Trump effect" (my words) on respondents who fear confidential information will be used against them by immigration authorities. There are several points to keep in mind about these interviews. First, the bureau is very clear that the interviews and focus groups were conducted only on a small number of people. Second, the bureau states that the focus groups and interviews were "qualitative studies and as such, unrepresentative of the population as a whole, and none of them were specifically designed to examine confidentiality concerns." So it is not clear what generalizations can be made based these on unrepresentative small samples. Third, even if respondents have become more reluctant to answer Census Bureau surveys or to fill in a particular question, it is not clear if adding one citizenship question on the Census would make any difference to response rates. What systematic evidence is there that people have become more unwilling to cooperate with Census surveys? We can gain some limited insight into this question by looking at the willingness of people to participate in the ACS. The bureau publishes the share of people each year who refuse to take part in the ACS. If more people are refusing to be interviewed by the Census Bureau each year it could indicate a rise in concern about confidentiality. Of course, it may indicate other social trends such as a decline in civic-mindedness. 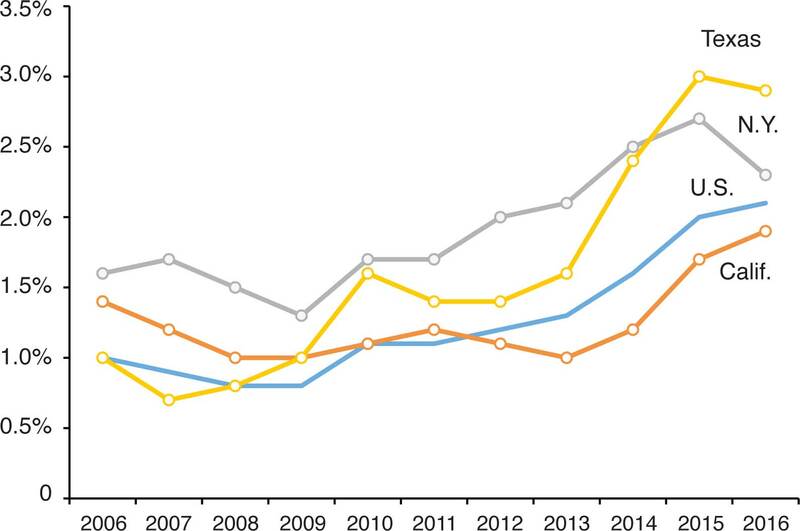 Figure 1 reports the refusal rate for the ACS from 2005 to 2016 — 2016 is the most recent data available and 2005 was the first year the survey was fully implemented. Figure 1 also reports the refusal rate in the three states with the largest immigrant populations — California, New York, and Texas. Figure 1. Share of persons who refused to be interviewed for the ACS shows an increase well before Trump’s rise. Figure 1 does show a significant increase in refusal rates nationally and in the top immigrant-receiving states. This certainly is a concern, and would seem to indicate that a growing share of U.S. residents are reluctant to participate in the ACS. However, several things stand out about the figure. First, the share refusing remains very small at just 2.1 percent in 2016. Second, the total increase from 2005 to 2016 was still only 1.1 percentage points. Third, it is clear from the figure that refusal rates were rising long before Trump came on the scene. Fourth, the increase in refusal rates for the most recent years available — 2015 to 2016 — was just 0.1 percentage points. If Trump was causing immigrants or perhaps others to not to take part in the survey, we would expect to see a big jump in refusal rates in 2016. After all, Trump was either running for president or was president-elect at the time that 2016 ACS interviews were taking place, and his support for stepped-up immigration enforcement received an enormous amount of media coverage. As for the top immigrant-receiving states, the trend in refusal rates looks very similar to the nation. While these states do have refusal rates that are somewhat higher than the nation as a whole, the increase in refusals was lower in California and New York than the increase nationally between 2006 and 2016. Texas's increase was somewhat larger over the last decade than in the nation as a whole. However, between 2015 and 2016 the rate actually fell slightly in Texas, as it also did in California. Again, if Trump's rise is creating confidentiality concerns and increasing the unwillingness of the public to answer a survey like the ACS, 2016 should show a large increase in refusal rate in high-immigration states. But Figure 1 indicates this is not the case. Another way to look for a Trump effect is to examine the ACS internally. Figure 2 looks at the share of responses to the citizenship question in the survey that have to be "allocated" by the Census Bureau. An allocated response means that the respondent left the question blank or gave an answer that did not make sense — for example, someone indicates on the place of birth question that he was born in the United States, but then indicates he is not a U.S. citizen on the citizenship question. Using a complex methodology, the bureau fills in or fixes these problematic responses. Figure 2. The share of unweighted responses to the citizenship question on the ACS that are allocated shows a long-term increase well before Trump's rise. Source: Public-use files of the 2005 to 2016 American Community Survey. Figure 2 shows that there has been a significant increase in the share of people whose responses on the citizenship question had to be allocated by the Census Bureau. Figure 3 shows the same pattern when the data is weighted. Weighting means the Census Bureau has assigned a weight to each person in the survey so that the total reflects the actual size and characteristics of the U.S. population. All figures publicly reported from a survey such as the ACS are weighted. But when looking at the data internally, it probably makes more sense to look at unweighted results. However, the rise in allocations shown in Figures 2 and 3 impacted both the weighted and unweighted data equally. Both figures show that over the last decade allocations have increased for the citizenship question. This may be a real concern, but it clearly pre-dates the candidacy and presidency of Donald Trump by many years. Perhaps most interestingly, the increase in allocations for the citizenship question actually seems to have stabilized between 2015 and 2016. As already mentioned, if there was going to be a Trump effect, we would expect it to show up in 2016. But neither Figure 2 nor Figure 3 shows such an increase. Perhaps most important, allocation rates for the ACS put out by the Census Bureau show that for almost every question asked in the survey allocation rates have increased — including but not limited to questions on employment, carpooling, education, income, age, food stamp use, and marital status. People seem to have become less likely to answer questions or answer them correctly across the board. Figure 3. The share of weighted responses to the citizenship question on the ACS that are allocated shows a long-term increase well before Trump's rise. Moving to a different data set, Figure 4 shows the monthly total foreign-born population in the CPS. The arrows show important events in the rise of Donald Trump. If concerns over confidentiality reduced response rates to the survey, we might expect that there would be some fall-off in the share of people who are identified as an immigrant (foreign-born). But Figure 4 does not show this is the case. After Trump announced he was running, and even after he secured the Republican nomination for the presidency, there was no statistically significant change in the measured size of the foreign-born population. Between June of 2015, when Trump threw his hat into the ring, and January of this year, when he was one year into his presidency, the CPS shows the foreign-born population grew by 2.5 million. Figure 4. 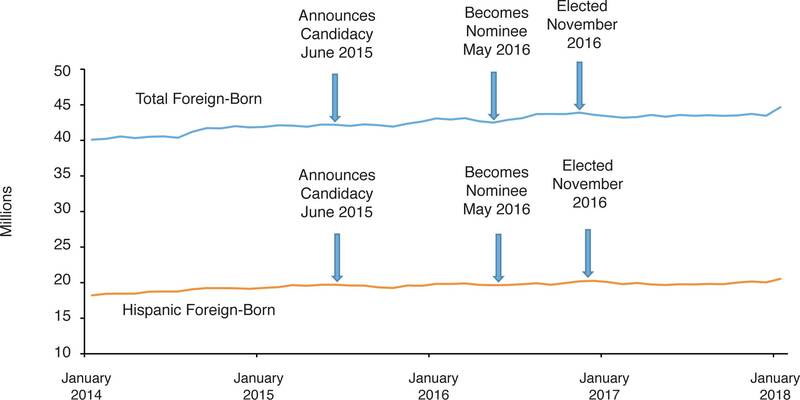 There has been no significant decline in the size of the foreign-born population in the monthly Current Population Survey associated with the rise of Donald Trump. Source: Public-use files of the January 2014 to January 2018 Current Population Survey. The CPS is weighted to reflect what the bureau thinks is the total U.S.-born population. Characteristics such as race, gender, and age are used to "control" these population totals. However, being foreign-born is not a control variable. As such, it is allowed to fluctuate in the CPS based on responses, in the same way that employment or wages are also allowed to fluctuate. But Figure 4 shows very little fluctuation. Figures 1, 2, 3, and 4 hardly represent an exhaustive analysis of a possible "Trump effect". They do indicate that refusal rates for the ACS, the survey most similar to the decennial Census, have been rising for a long time, but remain very low. Furthermore, while there has been a rise in allocations on the citizenship question, it, too, started long before the Trump presidency. Of course, more detailed analysis would be necessary to confirm these tentative findings. But I cannot find a sudden decrease in the public's willingness to take part in Census Bureau surveys that already include a citizenship question.